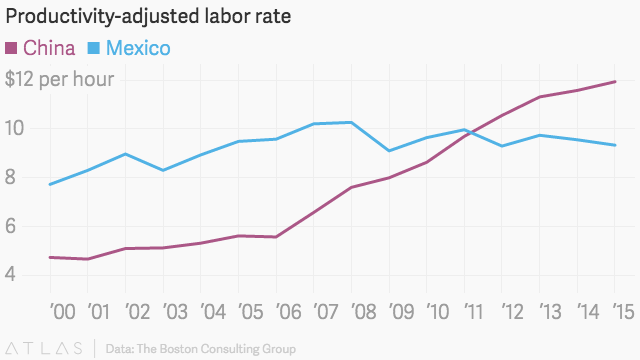 Mexico is beating China in the low-cost labor game. 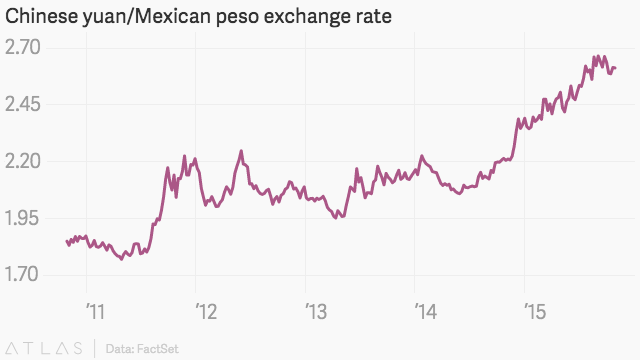 With wages rising rapidly in China, Mexico once again has become an attractive manufacturing hub—even to the Chinese. On Oct. 27, the state-owned China Communications Construction Company (CCCC) signed a preliminary agreement with the Mexican state of Jalisco to build an industrial park that would potentially house dozens of Chinese manufacturers, Reuters reported. The deal underscores the big shift in production costs across the two countries. 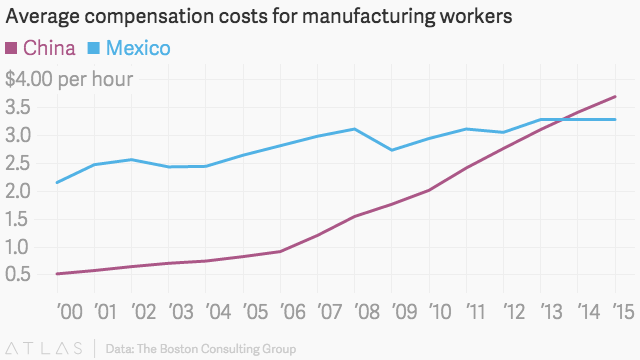 In 2000, workers in Mexico’s manufacturing sector earned nearly 60% more than their Chinese counterparts, according to the Boston Consulting Group. Now they earn 11% less. Adjusted for productivity, the gap is even bigger. Other production costs, such as energy, also have gone down in Mexico while climbing in China. Mexico is also much closer to the US, the world’s biggest consumer market and one of the brighter spots in the global economy. Jalisco’s governor, Aristóteles Sandoval, says the CCCC project (link in Spanish) would turn his state into a gateway for China to the rest of his country, and to the US. The proximity is a big advantage for companies that deal in products that need to be quickly turned around, said Foster Finley, a managing director at consulting firm AlixPartners. Another advantage for producers in Mexico: the Mexican peso has weakened considerably against the Chinese currency, making it, comparatively, all the more affordable to produce there.